ACCOMMODATION IN TIRUMALA: Tirumala Tirupathi Devasthanam is one of the famous, oldest and richest temples in southern India and it will open throughout the year. Every day more than 1,00,000 pilgrims visit the Shri Venkateswara Temple for darshanam. TTD introduces e-booking facility where in the pilgrim is provided to book rooms for accommodation before actually the pilgrim reach tirumala. 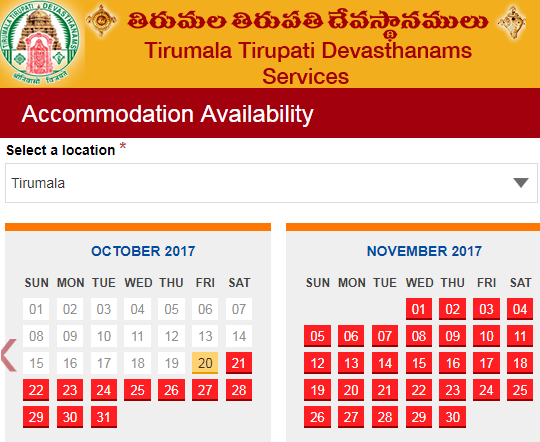 Along with these rooms for accommodation, pilgrims can book the special darshanam tickets and special seva tickets through the TTD official online website. For special darshanam tickets or rooms booking pilgrims need to register as a pilgrimages or a donor. Tirumala online room accommodation online booking availability checking web link are provided below. Through the link you can check if rooms are available to book online in tirupati & tirumala. TTD administration had brought many amendments with effect to ensure more transparency in allotment of accommodation to the pilgrims. TTD had built many public amenities complexes in tirumala. Which provide dormitory type accommodation in tirumala depends on crowd in tirumala without prior planning. During the times of brahmostava it is hard to get accommodation in tirumala without prior planning. In this we provide you the information about the accommodation in tirumala and what are the different types of accommodations are available for pilgrims are available in tirumala are as follows. There are different types of accommodation are available for the pilgrims in tirumala. They are. There are several large choultries are available for free room facilities to families to stay in reasonable comfort. Electricity and water are provided for free of charge. For free accommodation pilgrims may contact the Central Reception office, near bus stand in tirumala. Pilgrims can also rest in dormitory halls provided by TTD. Pilgrims can book the rooms for accommodation in advance through TTD kalyana mandapas situated in major cities throughout India or from meeseva centers or through the TTD SEVA ONLINE official website www.ttdsevaonline.com. Other than TTD cottages there are choultries near by temple who provide accommodation on arrival. And also many mutts and community accommodation halls are in tirumala which provide booking based on their rules. For booking rooms for accommodation you are allowed to book in advance between a minimum of 1 and maximum of 60 days a head of your schedule. C.R.O office is available for 24 hrs in tirumala which provide current accommodation booking facility for the tirumala pilgrims. private accommodation is not available in tirumala, private rooms online booking rooms are not available to book in tirumala . Its only avilalble at tirupati. In tirumala temple town Only tirumala tirupathi devasthanams (TTD) rooms & other many mutts (Authorized by TTD) are available @ tirumala. So Private rooms are not available in tirumala.